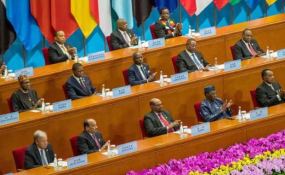 Heads of State and Government at the 2018 Summit of the Forum on China-Africa Co-operation( FOCAC) in Beijing, China. The seventh China-Africa summit was a diplomatic success for China. African countries can expect more cash injections. But this is not an equal partnership and the investments do not come without risks for both sides. "We receive African countries with arms wide open and we welcome them on China's development express." This statement from Chinese President Xi Jinping right at the beginning of the seventh Forum on China-Africa Cooperation (FOCAC) this week in Beijing made it clear that African countries are the only passengers on the express train of Chinese development. Much of what the Chinese head of state said in his speech -- which began with "China has agreed" -- did not sound like an equal partnership, which was also confirmed by the participants. Tom Bayes, a China-Africa expert at the Mercator Institute for China Studies (MERICS) in Berlin, said the summit was a "great diplomatic win" for China. "Talk of brotherhood and win-win and all that sort of rhetoric is clearly important, but I think the reality is clear to everybody there that China is presenting itself as a model to be followed to African partners," Bayes told DW. UN Secretary-General Antonio Guterres, who spoke about his support for China's one belt, one road initiative, spoke positively of the forum and China's "Community of Shared Future of Mankind." Bayes says even his participation and statements could be considered a success for China. Furthermore, China also suceeded in drawing the world's attention to its role as an important and positive player in and for Africa, Bayes added. China's only disappointment is that the Kingdom of eSwatini (formerly known as Swaziland ) did not break diplomatic ties with Taiwan before the summit. The small landlocked country is now the only remaining African country that officially recognizes Taiwan. Bayes describes China's approach with regard to Taiwan as a form of "carrot and stick" politics. "The People's Republic of China quite explicitly promises rewards to countries that are on its side," said Bayes. As a result, countries like eSwatini missed out on some political and economic advantages. From Taiwan's example, it's clear that China's economic and political interests in Africa are linked. President Xi Jinping announced at the summit that he would invest $60 billion (€51 billion) over the next three years, for industrial development, infrastructure and scholarships for young Africans, among other things. "We do not interfere in the internal affairs of African countries," Jinping said. "[We do not] impose our will on the African countries, attach any political condition on the economic aid for Africa, nor do we seek selfish political gains in investment and financing cooperation with Africa." Experts were critical of this approach even before the summit. African countries were in danger of getting into debt. The harbor in Hambantota in Sri Lanka is a good example of this: Because the island nation could not pay interest on a Chinese loan, the harbor on the new Silk Road was leased out to a Chinese state-owned enterprise for 99 years. To avoid these kinds of problems, Malaysia canceled two infrastructure projects at the end of August -- worth $20 billion -- which were to be financed by China. According to a study by the US-based China Africa Research Initiative (CARI), China is the main lender to three out of 17 African countries, which are in serious debt. There are main three reasons why China is a popular cooperation partner in Africa, Anzetse Were, a Kenyan development economist, told DW. First of all, the Chinese do not have a troubled legacy with the continent. Colonialism, slavery and failed restructuring programs from the World Bank and International Monetary Funds damaged Africa's relationship with the Europeans and Americans. Secondly, China is not enforcing any development policy regulations. And thirdly, the Chinese do not lecture Africa about issues such as corruption, democracy, and human rights. "Europeans and Americans think they have the right to meddle with African affairs," Were said. "The Chinese don't do that." In fact, China's financial and investment support comes without the attachment of specific conditions, in contrast to other partners such as the European Union (EU) and the US, for often ask African countries to respect human rights and maintain political stability in order to ensure their support. China has a significant influence in Africa, especially when it comes to economic relations. According to Chinese data, goods worth $170 billion were traded between China and Africa in 2017. The trade volume between the US and Africa during the same time period did not even reach a third of this amount. The EU is still trading with its neighbor, but could be overtaken if the imports and exports between Africa and China continue to grow. As a result, African markets are prone to fluctuations based on Chinese demand. But the debate over China's influence on the African continent is a distraction from the real problem, Were told DW. "The appetite for credit comes from the African governments. Kenya, for example, borrows money from all possible donors. It owes the World Bank more than it owes China." The problem with infrastructure planning is that it is missing an appropriate level of transparency. The African governments don't thoroughly check to see whether project proposals make sense, are sustainable and affordable. "Yes, we need infrastructure. But we can't just throw money at the problem. We need to be very strategic on the infrastructure plans that we have. We need to be very efficient and make sure we're getting the best deal we can for the price that we're paying." Bayes also doesn't consider China's strategy to be a "debt trap". But there is a danger that China could essentially be exporting its own problems. Many projects in the country are driven by corruption and political expediency. Feasibility and financial sustainability play a less important role. According to Bayes, in this respect China is less thorough and stable in its investments than the World Bank or the EU. This could ruin Peking's long-term political goals. If many of its infrastructure projects remain unprofitable in the long run, or if corrupt rulers use them to make money -- for example, if these projects come to light after a regime change -- China's reputation not only in Africa, but around the world, could suffer. The second greatest risk for China lies in its security policy, which is growing increasingly important in an attempt to protect its economic interests. Because of the unstable political situation in many African countries, they present a security risk. Two years ago in South Sudan, 350 Chinese oil workers had to be brought to safety. In 2011, China had to evacuate 35,000 countrymen and women from Libya. As a result, the Chinese lost projects worth billions. And that is why they opened a military base on a foreign ground, in Djibouti in East Africa, in 2017. As President Xi Jinping noted, a fourth of the promised $60 billion is made up of aid funding and interest-free credit. "It is for the people of China and Africa to judge whether China-Africa cooperation is good or bad," he said in his opening speech. "No one could deny the remarkable achievements of our cooperation, not with their assumption and imagination."